As the temperature drops below the zero mark, we thank you for your continuing financial support and your prayers. It has been an incredibly busy autumn at the radio station Everyone�s putting in a dozen or more extra work hours every week, and thanks to you, the mission signal continues to beam strong and clear. Thank you for your helping hand! In the bitter cold of mid-October, Nome resident Lilly Rose fishes in the traditional Eskimo way for small tomcod in the just-frozen salt water of Safety Sound, about fifteen miles east of Nome. 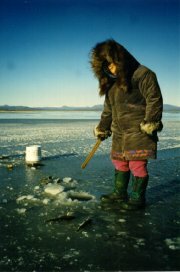 Across isolated western Alaska, thousands of people primarily support their families by living off the land. They�re savvy about ice conditions -- they have to be. Here, the layer of clear, new ice is less than two inches thick. I watch a stonecutter put hammer to chisel and strike the stone one hundred times. The stone breaks on the one hundred-first blow. Yet I know that it was not the one hundred-first blow which produced the break, but the one hundred which preceded it. top of page AT LAST -- ALMOST: The attorneys and engineers plan to have all of the final paperwork ready the first week of November, and about two weeks after that, we expect final FCC permission to transmit at 25,000 Watts. Hurray! CONGRATULATIONS are due to everyone in the KNOM family, to all of the staff and all of our benefactors, as the station has won the Alaska Broadcasters Association�s top honor, the "Community Service Award," placing our station above every radio and television station in the entire state! Meanwhile general manager Tom Busch was traveling to Washington, DC for the November 8th Gabriel Awards ceremony, to receive their "Radio Station of the Year" award for the second year in a row. Some two dozen KNOM supporters and former volunteers planned to attend. Stay tuned! 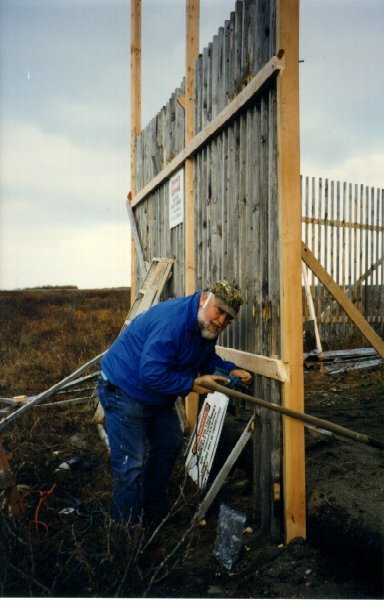 top of page GENERATING INTEREST, but not much else: (left) Our contractor is stuck framing in two additional houses in town, and while he promises to get to our emergency generator shed before the serious snows, it�s still only a platform, 3 miles east of Nome. You can see our new transmitter building and the tower at left. "DON�T FENCE ME IN," went the old song, but the FCC disagrees, and Les Brown almost single-handedly built our enlarged fence, to protect folks from tower radiation. 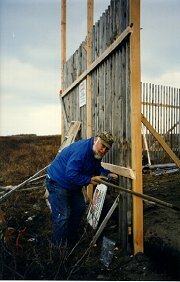 The fence cost $931 dollars for material, and Les figures by doing it himself, he saved the mission about $4,500 in labor costs. Thank you, Les! INSPIRATIONAL SPOT: Sometimes we are surprised by how God chooses to work in our lives. We say "it can�t happen this way!" but our God is truly above our ways. He delights in coming to us in ways that could only be His. MYSTERY SOLVED? A while back, we reported that Saint Lawrence Island villagers had discovered thousands of dead seabirds washed on shore for no apparent reason. In October, U. S. Fish and Wildlife scientists announced that the mass die-off was apparently caused by El Niño, that large patch of warm water thousands of miles to the south. The immediate cause was starvation, they say. The birds normally feed on small fish and tiny shrimp-like creatures. This past summer, the surface of the Bering Sea was unusually warm, driving the bird food deeper into the ocean where the water was cooler, too deep for the birds to reach. Among the species suffering were kittiwakes, murres and shearwaters. The news isn�t good: experts predict another round of die-offs in the coming months. INSPIRATIONAL SPOT: When you walk in deep snow, it�s always easier if someone�s walking before you to break trail. Christ walked ahead of us on this earth -- loving, giving, even suffering so that we would truly know that He understands how tough the trail gets. It�s very important that we stay on the path of loving and giving, or we�ll not have His trail to guide us. 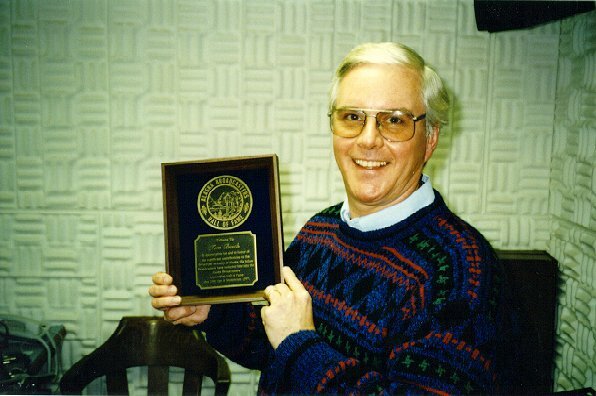 top of page At the annual Alaska broadcasters meeting in Anchorage, KNOM manager Tom Busch almost fell off his chair when he was called to the podium in front of 200 fellow radio and TV folks to accept induction into the Alaska Broadcasters Hall of Fame. Tom is the 29th person to be so honored, and he was "astonished and delighted." IF YOU DON�T HAVE A COMPUTER, you might know a family whose kids know all about that kind of thing, and one of the youngsters might be able to lead you to KNOM�s web site on the Internet. Our address is www.knom.org. 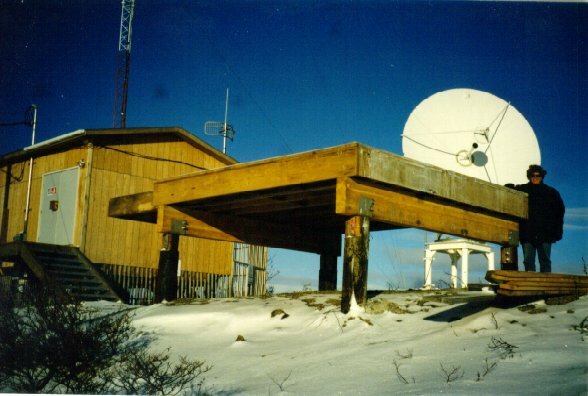 Thanks to former KNOM news director Tom Bunger, who continues to volunteer his time keeping the site current, you�ll find our "Nome Static" photographs in color, and around a hundred other pictures and lots of information on the mission. BUT WAIT, THERE�S MORE! Your mission radio station has won so many awards recently, we ran out of space on page one....in addition to being named Alaska�s top broadcasting station for community service, KNOM was also honored for best radio entertainment program (for Mary Davenport�s Christmas drama "A New Nativity"), as well as best public service announcement for a spot on safety produced by Paul Rauch and Tom Bunger. Thank you for making all of KNOM�s programming possible! top of page VILLAGE THREATENED! KNOM has been keeping folks informed of the serious erosion threat to the village of Shishmaref, 125 miles northeast of Nome on Alaska�s rugged Chukchi Sea coast. For hundreds of years, the village of 600 souls has thrived on a barrier island, basically a long sand bar, and in recent days, the ocean has been chipping away at the sand. Recently, things took a sudden change for the worse when high waves extensively damaged four homes. Eleven others were imminently threatened -- their foundations undercut, hanging precariously over the edge of a sandbluff. The eleven houses are being moved to temporary safety, and village elders are mulling over options for the future, which might include moving the village. That, however, would be extremely expensive, and villagers say there is no suitable site nearby. Right now, they�re hanging on, praying that storms hold off until the sea has frozen with a thick protective layer of ice. INSPIRATIONAL SPOT: Age is like the top of a high mountain. The air is thinner. Once-jagged peaks are worn smooth. It�s a long, hard climb and there�s a bit of fatigue. But oh, what a wonderful view! top of page WHAT�S THIS? 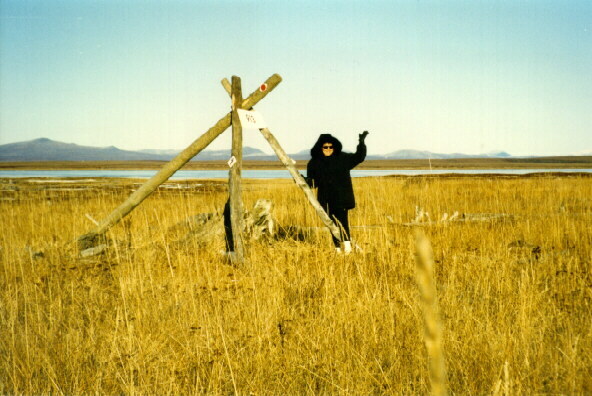 Why, it�s an Iditarod Trail marker, built with driftwood logs and anchored to the sandy tundra, 25 miles east of Nome. This particular marker was built by Tom Busch and Ric Schmidt. The Busch family "adopted" Mile 913 of the historic trail, pledging to keep the tripod in repair as a guide for mushers and other travelers. In the Alaska wilderness, when weather turns sour, these large tripods can be lifesavers. Florence Busch poses by the marker on a +10° October day. INSPIRATIONAL SPOT: It�s the little things in life that are important. It isn�t the mountains that wear me out, it�s the tiny rock in my shoe. How about you? Do my very small acts of kindness make you just as happy as your thoughtful acts make me? Thank you once again for your prayers and your financial support. We could not survive without them. May God bless you. Perhaps next time, we can announce our switch to 25,000 Watts! In the meantime, please accept the thanks and prayers of the KNOM staff for your generosity. Thank you!